The butternut squash flavor is mild, borderline nonexistent, but it sure did give the peas a lovely orange hue! 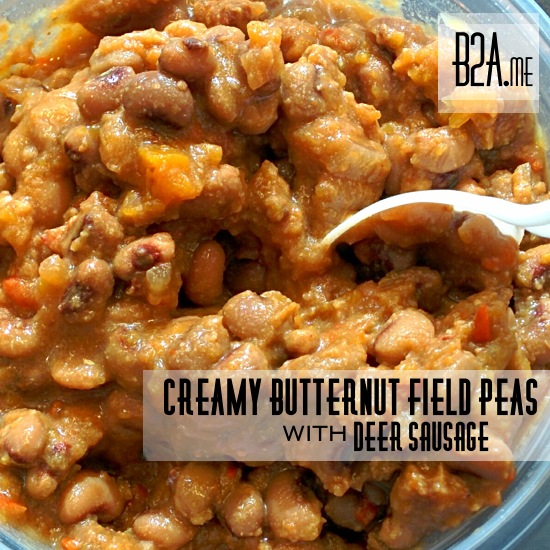 This recipe is very reminiscent of pork and beans. It’s a little bit sweet, with a creamy texture and hint of BBQ flavor. I utilized the good ole Southern variety of Vigna unguiculata: Pink-eyed Purple-Hulled Peas. This variety of field peas has a much milder taste than black-eyed peas. Then, instead of sweetening the peas with a more traditional method [namely, sugar], I used butternut squash. It completely cooked down and added both sweetness and a creamy texture. The sweet red bell pepper may have also aided in sweetening up the dish. The finishing touch was the sausage. I’m still on a deer sausage kick, since there is a plethora of it in my freezer. 2. Add remaining ingredients to crockpot, cook on LOW for 5-7 hours.